Yes, another burglary, but this time it wasn't us personally, that was burgled. Someone one broke into the substation outside the church parking lot and stole all the copper wiring inside. We noticed something was amiss Saturday night at the Chinese Thanksgiving dinner. There was no air conditioning. It was really noticeable Sunday at church. It got quite hot and humid. I told the Elders that if President Monson was there, he would most assuredly direct to remove our jackets. It was pretty unbearable! (By the way, I have heard President Monson do this in a Priesthood session or two of General Conference.) The air conditioner was later restored to the chapel, but that was the only place in the building. We were able to have our Youth Conference committee meeting in the cool. Unfortunately it shut off before we got through with choir practice. Choir practice was a little shorter than usual. It doesn't take long for things to heat up without the air cons. It's going to be quite expensive to replace the wiring. Copper thievery doesn't just happen in the USA. Time is flying by! December 1 marked the three-month mark of our mission. I was reading my cousin Marty's newsletter. They'll be heading home soon. I hope we can accomplish as much as they have before we return home. Monday we took the ZLs to the post office so they could mail some packages home. They are always asking us if there is anything they can do to help. We usually tell them no, but today we took them up on their offer. We had them change some light bulbs that were a little awkward for us older folk to change. 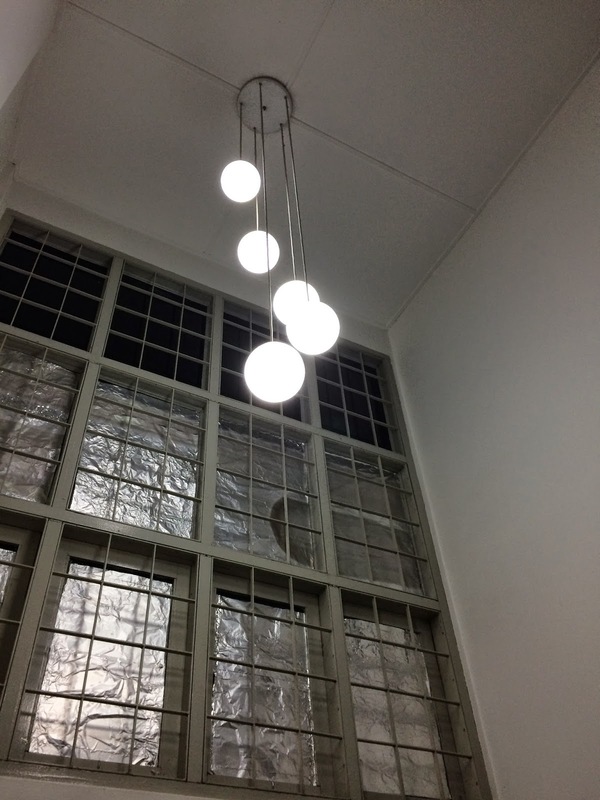 I had managed to change the bulbs in the lower three globes, but the upper two were too high for me and the ladder. The missionaries came to our rescue and replaced the top two bulbs. When they were done, we fed them crackers and home made salsa. Since it's now December, we asked if they'd like to set up our Christmas tree and decorate it. They jumped at the opportunity. It was fun to watch them. Of course, we had Christmas music playing in the background. 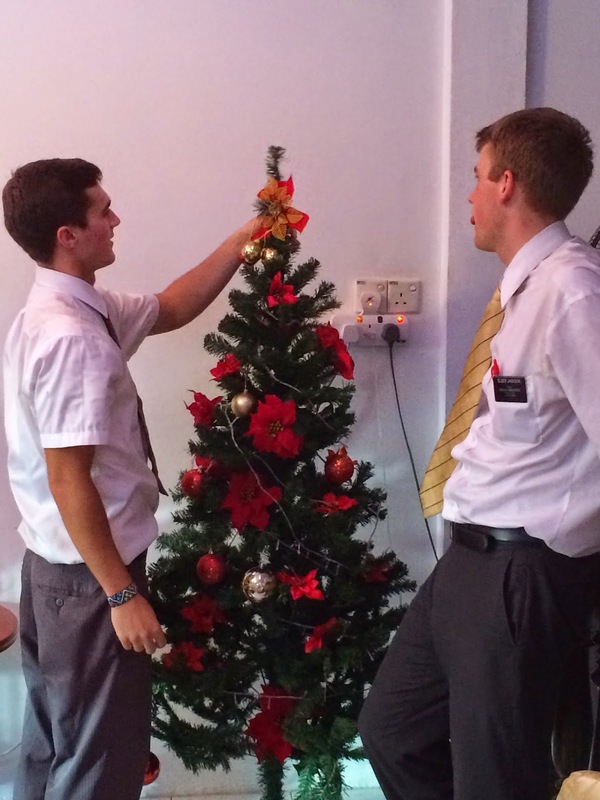 After the tree was set up, Sister Bodell fixed them dinner, and then I took them back to their place so they could get to their appointment on time. Just adding the final touch! Thursday was a bizarre day for me. I don't know why, but I didn't sleep well Wednesday night. I was tired. We had language lesson with our tutor, and I was really tired for that and discouraged that Sherrie is doing so well, and I am struggling. Eventually everything caught up with me. I think I was somewhat homesick, too. I miss the kids and grandkids, other family, friends, decorating the house inside and out, setting up the train in the front room, Choir practice with the ward choir for the Christmas Sacrament meeting program, Christmas parties, yada, yada, yada. I was pretty bummed all day. I know what and why Wednesday was happening, but I was having trouble getting through it. However, after getting a good night's sleep Thursday night, I felt 200% better on Friday. There is no better place to be at Christmas than the mission field, sharing the Gospel with other people. This is where we need to be at this time. I don't doubt that at all. We are looking forward to Zone/Senior Couples Conference next week in Singapore, then Youth Conference the following week, then Christmas, then get seminary started here in Sibu. It will be busy, but exciting. Speaking of Youth Conference, we've had to get a lot of shopping done, and get the T-Shirts designed and ordered. That's been a task, but the shopping and, as of last night, the T-Shirts are ordered. Thanks to Josh and Aaron for their help. Here is the final work up how the shirts will look. 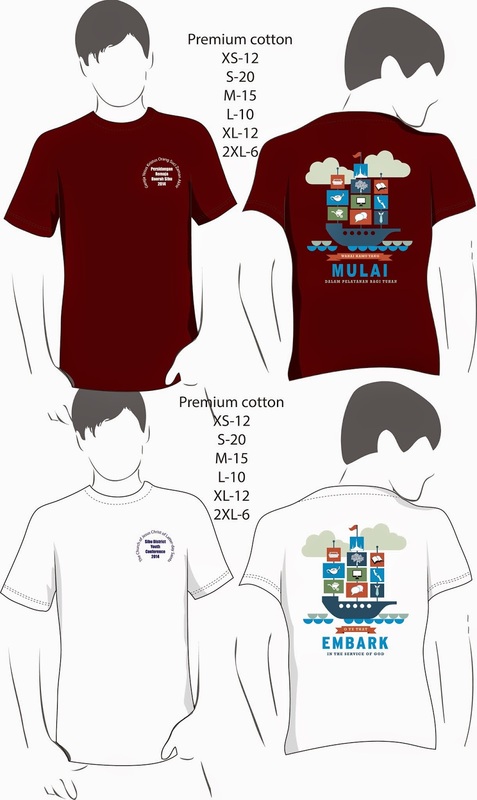 The maroon shirts are in Malay; the white shirts in English. Everyone will get one of each color. Here it is Friday night already! Tonight's project is to help Branch 1 with their membership audit. It was originally due in June, but that didn't happen. We helped Branch 2 with their audit a couple of weeks ago. That was our first one. It wasn't too difficult because we had the branch president with us who knew most of the people in the branch. Tonight? Hmmm. . . . Success! We finished the Branch 1 membership audit this evening. We were able to sit down with the branch clerk and show him how to do it. He should be able to do himself next time. We also received word that we'll probably be involved with the financial audits at the beginning of the new year. One more thing to complete tonight . . . design the program for Youth Conference. We started working on it, and continued working on it late into the night. We finished it up Saturday morning and got it printed. Done! Tomorrow we can actually rest? Not likely! It's Sunday, and we have Primary, Temple Prep, Youth Conference committee meeting, and choir practice, and then prepare to leave for Mission Conference. We were able to have a second session of language study with the zone leaders Saturday afternoon. This has been most helpful to us. I am grateful for their help. Thank you Elders J and S!